Ability Points: DEXterity, ENDurance, and PREsence; required for use of various skills. Age of Council (AoC): A universal date system used in Wyvern Rising. Dates are determined by the number of years since the creation of the Peace Council. Years before the inception of the Council are designated by PreC (Pre-Council). After Action Report (AAR): An After Action Report is a detailed report detailing what a character is doing in between events, including crafting and traveling. If a player does not wish to go anywhere, see anyone, or do anything, an AAR is not required to be submitted. All AARs must be submitted by the Sunday following an event. Armed: Having a weapon or shield ‘readied’ even if you do not have the skill to use it. Both bows/crossbows and arrows/bolts are considered weapons. Attack, Physical: Any attack delivered by weapons, claws, or fists. Avoided: Used to denote when an attack is mitigated by moving out of the way. Base Skills: These skills represent fundamental skills that any player can always learn at the marked build cost. Block: Used to denote when an attack is mitigated through contact with an object, prayer, or spell effect. Body: This represents the amount of health points a character has. Boffer Weapon: A simulated sword, axe, staff, etc., made of PVC and foam, that allows safe game combat. Bonus: Skills listed under Bonus are acquired for immediately for free once the prerequisite Sphere Ranks are met. Build Points: Points that are used to purchase new skills and abilities to enhance your character. You earn additional Build Points every time you attend an event. Usually referred to as simply “Build”. Crafting Points: Represents an amount of time available to craft items (such as weapons, armour, and alchemy) for Out of Game purposes. Each item requiring Crafting Points will denote the amount needed for creation. Cross Skill Spheres (CSS): These include all Skill Spheres that were not chosen as a player’s Primary Skill Spheres and cost double the marked build to purchase any non-Base Skills. Damage: Any attack given with just Damage is done first to a character’s Armor Points unless they have none, then it affects the character’s Body. Damage, Body: An attack given called as Body bypasses any armor and directly affects the target’s Body. Death Count: The six-minute period from the time you reach zero Body to when your spirit leaves the body and your character is dead. Deathmark: The special symbol on the six-sided dice that are rolled at the time of a resurrection attempt. If two Deathmarks are rolled, your character is permanently dead. DEX: Dexterity points; a type of ability point used for skills that require agility or fine manipulation. Director: An officer of The Wyvern Group. 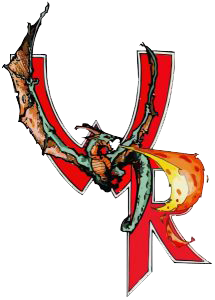 Directors have final authority and responsibility for all aspects of Wyvern Rising and Wyvern Group operations. END: Endurance points; used for skills that require physical strength and stamina. Exhaustion: Characters that suffer the effects of Exhaustion are unable to use skills that require Ability Points (Endurance, Dexterity, or Presence) in order to use them, such as Crit +2 or Courage. Flank: This refers to a character/player’s back. Headband, Orange: Worn to signify that your character is dead. Only certain characters have the ability to make contact with these spirits; all other players must ignore them. Headband, White: Worn to signify that you are OOG. Players wearing a white headband cannot interact with the game environment. Hold: A call representing a pause in all game action. In-Game: Any person, item, event, or knowledge that is within the game structure, plot, and parameters. LARP: Live Action Role-Playing. A form of entertainment that utilizes interactive free-form scenarios to challenge the participants. Lay-On: A call representing the beginning of the game or resuming after a Hold. Lay-Off: A call representing the end of the game. Local Effect: Effect that targets an area large enough that it can not be avoided. Skills like Evade cannot be used to Avoid this. Meta-gaming: The act of using out of game knowledge or items to influence in game play. This is cheating and therefore strictly forbidden. Negate: Used to denote when a skill completely nullifies an attack, prayer, spell, or other effect denoted by the skill used. Non-Player Character (NPC): A game persona or monster portrayed by game staff. NPC’s are instructed by the game directors and are not operated independently of the game plot. Out of Game (OOG): Any person, item, event, or knowledge that is not involved in or pertinent to the game structure or plot. Period: One of the two time segments into which an event weekend is divided. At the beginning of each period ability points, prayers, and spells are refreshed. The first period lasts from the start of the game Friday night until 3 pm Saturday with the rest of the event being considered the second period. Phys-Rep: Physical Representation. Refers to any item that is used in place of or to represent some object. A boffer weapon is a phys-rep of a sword. Player Character (PC): A game persona portrayed by a player. The PC acts independently and as the player desires. He/she is bound only by the game rules. PRE: Presence points; a type of ability point used for skills that require mental discipline or strong will. Personal: Skills, spells, or prayers that may only be used on yourself and may not be used on other players. Primary Skill Spheres (PSS): The three Skill Spheres a player selects to be his/her character’s principle choice for purchasing skills. Cross-Sphere skills (aside from base skills) take double the amount of build to purchase unless otherwise noted. Point-and-Click: A method of delivering certain spells, prayers, and skills that involves pointing at your target, instantly delivering the effect of the skill. These skills are noted in their descriptions if they are delivered in this manner. A Prayer, Spell, or Skill that is delivered via Point-and-Click can only be Negated. If the Point-and-Click deals any kind of Damage (Body, Fire, Damage, etc) it may be avoided with the skill Evade. Quarter Build Cards: Points awarded by the game staff to players who donate game materials or supplies to The Wyvern Group, or who assist with setup, cleanup, or other tasks. Four Quarter Build Cards may be redeemed for 1 Build Point. Quarter Build Cards may only be redeemed during check-in at an event. A maximum of 2 Build Points worth of Quarter Build Cards may be redeemed per event. Role-Play (RP): Acting or portraying a character within the game world. Role-Playing Points: Awarded to players who do a particularly good job of portraying their characters. May be awarded for consistent effort or for an exceptional situation. 100 Role-Playing Points can be exchanged for 1 Build Point. Rules Marshall: A player that is knowledgeable in the Wyvern Rising rule set that is specially designated by the game staff to make on-the-spot rulings and marshal in-game thievery. Silver or Better: Commonly used to represent any type of attack that deals damage that is not just Damage or Body. Some examples include Silver, Fire, Solar, Magic, Ice, and Divine. Soak (Number): A character with a Soak (Number) will reduce damage received by the number within the parenthesis. Spell Packet: A small bean-bag, filled with birdseed, that is thrown to represent spells, prayers, and other ranged abilities. Sphere Ranks: This number represents the knowledge in a sphere the player has obtained. Purchasing a Base Skill within a sphere grants one Sphere Rank with every skill from higher tiers granting one as well. A Sphere Rank can also be purchased at a base cost of five build, or ten build for Cross-Spheres. Stun: Characters that suffer the effects of Stun are unaware of their surroundings for the duration of the Stun. Characters cannot see or hear anything until they are relieved of the effects. If a character takes Damage under the effects of Stun, the effect ends immediately. Tiers: Tiers are subsets of skills within Skill Spheres that represent the level of Sphere Ranks necessary to buy skills within the Skill Sphere. Weapon Strike: This consists of a single swing of a weapon, regardless if it hit anything or not. Skill Type: Describes what and how, mechanically, a skill is used. Every skill has a type and they are listed below. Ability Point (AP): Skills that use a number of ability points from your Ability Point pool. Ability points include Endurance, Dexterity, and Presence (also shortened to PRE, END, DEX). After Action Report (AAR): Skills that are active, either in full or in part, inside of an After Action Report. Such skills must be stated when used in the player’s AAR. Body: Skills that add to your Body total. Continuous: Skills that are usable or are active at all times. Craft: Skills that require Crafting Time in order to produce results. Faith: Skills that have this tag deplete a character’s Faith pool when used, similar to Ability Points. Fear Effect: Skills listed with this tag mimic the effects of Fear. Juggler: Skills that are listed as Juggler may only be delivered using a Thrown Weapon. Marksmanship: Skills listed with this tag may only be delivered by a bow or crossbow. Skills listed with the (bow) and (crossbow) tags may only be delivered using their respective weapon types. Mind-Altering: Skills with this tag change the natural demeanor or mental state of their targets. Oath: Some Tactician skills are labeled as Oath skills. Oaths are delivered through the use of an Emblem. Only one Oath may be active on a single person at a time. If another Oath is used on a person, the new Oath overrides the previous and is now active. Period: Skills labeled with the Period tag must either be used or locked-in at the start of a Period and may not be changed. Physician: Physician skills are labeled in order to signify when a skill or item may interact with them. Sacrifice: Skills with this tag require you to expend a Spell Slot in order to utilize them. Shield Skill: Skills containing this tag may only be used when holding a shield. Shields are not considered weapons and may never be used to strike another player, whether you are using a skill or not. Special Attack: An attack which is typically delivered in an unusual way, to an unusual target, and/or with an unusual effect. Surprise Attack: The intended target of this skill must be unaware of the attacker or the incoming attack OR be otherwise unable to defend themselves against the attacker. Examples include: asleep, unconscious, Stunned, Paralyzed, Subdued, or engaged in battle with another player. The attacker must strike the target’s flank with his/her weapon unless otherwise noted. Total Knowledge Requirement (TKR): Skills labeled in such a way are required in order to cast a spell, channel a spell, or perform a ritual. Weapon Skill: A weapon skill allows a character to use a designated weapon type without penalties, which includes the use of skills and swinging that weapon types base damage. Without a Weapon Skills, a player may use any weapon but without the use of skills and may only swing for 1 Damage.